WHAT THEY DON’T PUT IN THEIR PRODUCTS IS AS IMPORTANT AS WHAT THEY DO! If you can’t find it, why not invent it? That’s just what two registered nurses did. This new breed of pure-nutrient skincare for anti-aging and challenged skin was created by two nurses, Nan Brown and Lil Bogdan, who worked with burns and severe dermatological conditions at Johns Hopkins and other leading hospitals. After fifteen years of treating skin at its very worst and studying clinical and holistic skin healing principles, they discovered that skin responds best to pure, potent, nutrient rich natural preparations. After much research L’Athene was born! THIS ALL-IN-ONE CLEANSER DISSOLVES IMPURITIES, Make-Up and Excess Oil... without Detergents. Smoothes and tones without stripping skin. Most skin cleansers and soap contain harsh detergents…that can strip the protective acid mantle of skin... leaving skin imbalanced, irritated, and dull-looking. Cleanses gently and effectively with natural cleansing agents that balance, restore, nourish and effectively cleanse dirt, pollutants and dead cells from skin. Contains French Lavender Oil which is known to tone, calm and help to regulate sebum production. Natural antibacterials effectively help to remove bacteria. Gently cleanses, helps protect and maintain skin barrier, and limits rise of unintended effects from procedure. Even has antioxidant protection. For use, following the post-op program, when your skin is ready for skin care products. Important to use gentle, non-irritating skin care products that are nourishing for delicate skin. Procedures such as IPL, laser skin resurfacing, microdermabrasion, chemical peels. 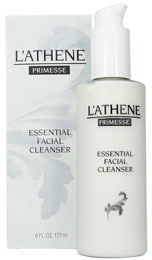 KMR Communications, Inc is pleased to offer one of my lucky readers the chance to win 1 (one) PRIMESSE Essential Facial Cleanser from www.lathene.com. Required Entry- To enter, simply leave a comment telling me why you want to win this product. 1. For five extra entries, blog about this giveaway with a link back to living life one day at a time (http://colleenstearns.blogspot.com/). Be sure to post the url to your post here in a comment so I know where to find it. 6. Follow living life one day at a time on Twitter AND Tweet about the giveaway. Leave the URL to the Tweet in your comment. You can tweet once a day, but remember to leave the URL to each tweet. You can tweet "I am trying to win a PRIMESSE Essential Facial Cleanser @livelifereviews. http://tinyurl.com/4zgwr9a #giveaway"
*Enter by 11 pm (EST) on Friday, March 11, 2011. The above cream made up of lavender oil is very useful for young peoples, this is used to balance oil in our face and provide anti-aging protection. Thanks a lot. I want to try it because it soothes redness and inflammation. I would love to try this because I have sensitive facial skin. It gets dry and red and prone to imperfections. I have been looking for a new facial cleanser and would love to try this. I like that it does not contain any harsh ingredients. I would like to win this because as I get older I notice how sensitive my skin is getting and would like to keep it looking young. I would love to win this product for my dry skin! I am always on the lookout for cleansers that are gentle and provide enough moisture. I am a public follower of your blog via Google Friend Connect. I want to win this because I'm not as young as I used to be and it shows! I follow your posts which very interesting as always ! !